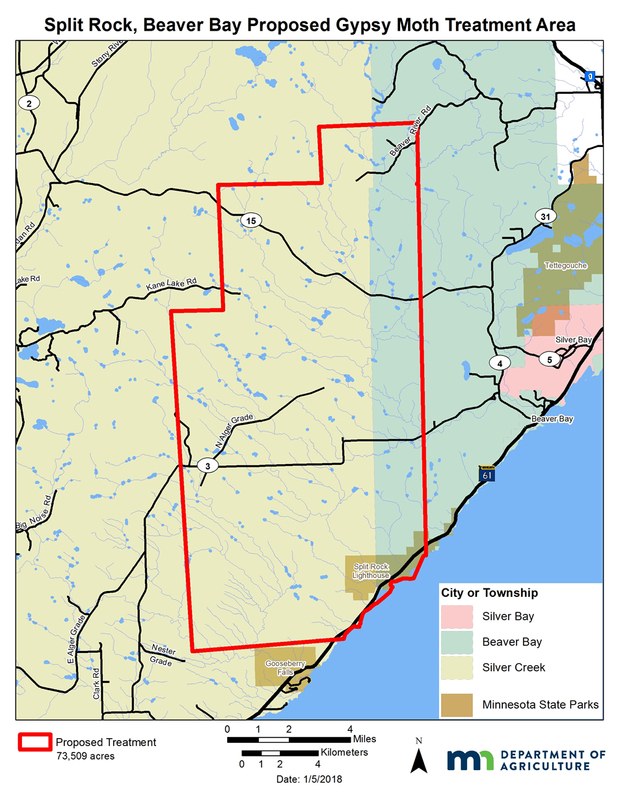 The Minnesota Department of Agriculture (MDA) will treat approximately 73,500 acres of land in the Split Rock/Beaver Bay area of Lake County to slow the spread of a gypsy moth infestation. Officials will conduct the aerial treatment starting Monday, July 16. The treatment may take up to three days to complete. To help area citizens stay informed, the MDA has set up an Arrest the Pest information line at 1-888-545-MOTH (6684). The hotline will offer the latest details about the treatment. Residents can also sign up for email or text notifications. The MDA maintains a monitoring program to watch for start-up infestations ahead of the advancing population front moving into Minnesota from Wisconsin. When an infestation is found, the department conducts aerial treatments of the infestation before it can spread further westward. In 2017, the MDA found an infestation along the North Shore. In cooperation with the USDA Forest Service, the department is now treating approximately 73,500 acres, including 11,000 acres of Superior National Forest land. (SEE MAP) Details of the area can be found at www.mda.state.mn.us/gmtreatments. The MDA will use a method of mating disruption involving the aerial application of an organically certified, waxy, food-grade substance containing pheromones that confuses male gypsy moths. This makes it difficult for the male gypsy moths to find females for mating, which means reduced mating success. The result is fewer caterpillars hatching and attacking trees next year. The mating disruption product is applied from airplanes that fly about 100 feet above the ground. Airplanes will be in the air from approximately 6:30 a.m. to 5:00 p.m. each day until complete. Residents and visitors in the area will notice the yellow airplanes as they move through the treatment area. This work is being coordinated through the national Slow the Spread of Gypsy Moth program directed by the U.S. Forest Service. Minnesota has been part of this program since 2004.